Disclaimer: I bought 2 shares of Duke Energy through a DRIP back in @ 1990, and sold them within a year to book a $45 profit. Another disclaimer: I’m not picking on Duke, as there are many other coal-fired power plants with faulty ponds and practices favorable to emptying a slew of heavy metals into our rivers or landfills. But the Dan River spill was the second largest in U.S. history. Let’s face it, “clean coal” is one of those oxymorons guaranteed to make us all look foolish. In fact, putting a nice adjective in front of that dirty word is tantamount to saying, hey, we have a singular solution that’s going to save our planet, or keep us out of harm’s way when that next coal-ash pond bursts, like it did this past February at Duke Energy’s retired (2012) Dan River Steam Station in Eden, N.C—82,000 tons of coal-ash slurry along a 70-mile stretch of the river. Someone from PR must’ve thrown her that life ring. Too bad they didn’t have that mantra ready to use last September when Duke illegally began pumping 61-million gallons of coal-ash waste water from their Cape Fear power plant (Catham County) into another river, the Cape Fear River, and didn’t stop until a month after the Dan River debacle. But Duke’s “disciplined approach” in calling its dumping as routine maintenance of their unlined pond (built in 1985) was a deliberate act, according to charges brought against Duke Energy by North Carolina’s (NC) Department of Environment and Natural Resource (DENR), as reported recently in the New York Times. The deed was unmasked by the Waterkeeper Alliance, a New York-based group. 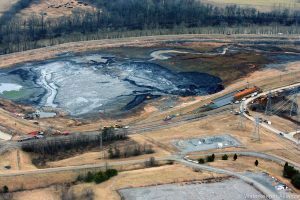 Not that there’s anything wrong with a little dumping of excess wastewater into a nearby river, but it’s okay for coal-fired plant operators, like Duke Energy, to actually discharge specific amounts of wastewater from their ponds into an adjoining waterway, as long as it’s been tested before hand. However, the DENR lambasted the pumping as anything but “routine maintenance,” and slapped the energy company with what could be a $25,000 a day fine for every day they violated their permit. Of course, this makes the DENR look like a worthy environmental overseer, one who keeps an arm’s-length relationship with all the energy players in the state. Sadly, that is simply not the case, as federal investigators jumped in early last year when they suspected wrongful activity on the part of DENR, who slyly alerted Duke Energy about a citizen-activist group who wanted to muscle in on settlement proceedings state’ regulators were involved in: the Southern Environmental Law Center had announced it was going to sue Duke because, yes, it’s coal ash pollution violated the fed’s Clean Water Act. It was Duke who then got in touch with the DENR and voiced their objection to any outside input, particularly from those dogged environmental dandies. As it stood, Duke was looking to get off easy with a mere $99,000 fine from state regulators; plus, they could avoid having to clean up its polluting ponds—a pittance for this $50 billion company when compared to the potential outcomes from private lawsuits. Duke pleaded their case to stop outside groups from having their say in those state hearings, but, alas, the court said you-gotta-be-kidding me. And then a funny thing happened after that fated day in February, the day of the Big Spill. You see if the coal-ash hadn’t poured forth into the Dan River, then maybe Duke would’ve gotten off lightly with the state’s own $99K fine back then, which is now on hold. But after the thousands of tons of wastewater bespoiled the river some ten-months later, federal prosecutors started looking at the cozy relationship that Duke had with the DENR, and added that to their ongoing criminal investigation into what is the second largest coal-ash spill in our history. Yet, some North Carolinians felt it was never, ever possible for state environmental regulators to really do their job effectively when the gorrilla in the room, Duke, was getting what they thought were preferential nods from its own governor, Gov. Pat McCrory. Not only was he a former mayor of Charlotte, but he also worked for Duke Energy for almost three decades. So how’s Duke handling their “fact-based” pursuit to get to the bottom, top and sides of this matter? Evidently, they’d prefer to keep all of this in-house, and not have to worry about all that foul PR they’re generating. In fact, they went to court in late March to plead their case to keep all the records about the spill sealed from NC regulators and the environmental groups while the feds do their investigation. No surprise, but the citizen groups will be given copies of those same documents that Duke will be handing over to prosecutors. Two-and-a-half month’s after the February 2nd spill, Duke’s stock price was three points off its 52-week high.